Four-color process printed on both sides of 12pt C2S White Semi-Gloss stock. Coated with Aqueous Gloss. 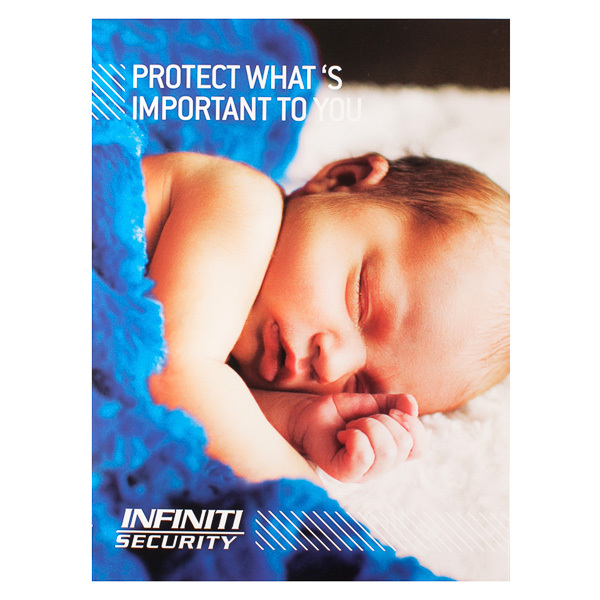 Infiniti Security emphasizes its slogan with a photo of the person a family most wants to protect—a sleeping infant. The logo at the bottom balances the tagline at the top, as the blue blanket uses color branding to imply security. All three interior panels provide brand info, complete with photos and diagrams. Die-cut pockets spice up the interior with cool, creative shapes. The back cover simply shows the blue fuzzy blanket, with slanting white lines at the top to balance the contact information at the bottom. Four-color process printed on Side 1 of 12pt C1S White Semi-Gloss stock. Coated with Aqueous Gloss. B5 brochure slit on left pocket, with V4 business card slits on right pocket. 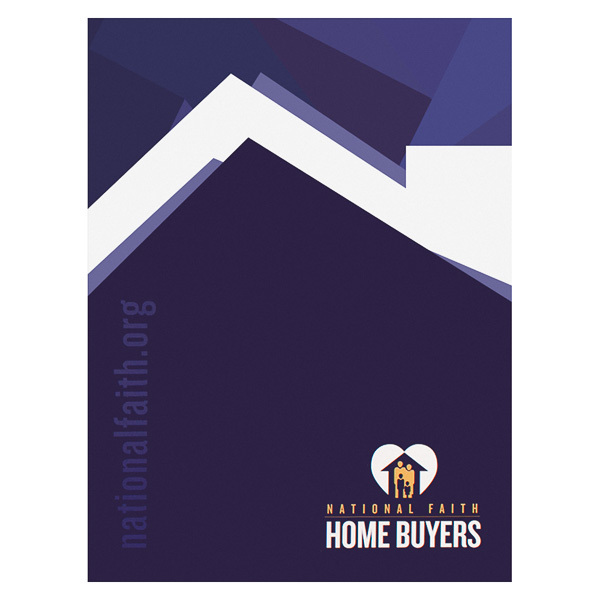 Blue and white lines take the shape of a house, alluding to National Faith Home Buyers' role in helping people move into their new homes. Yellow text adds a touch of warmth to the logo. The large-print URL is written in blue, blending subtly into the cover. Inside, the brand colors accompany pictures of families moving into their new homes. On the back, recipients can learn more about the nonprofit’s mission or find contact information for its Detroit office. 1 PMS color printed on Side 1 of 120lb C2S White Gloss stock. Coated with Aqueous Gloss. 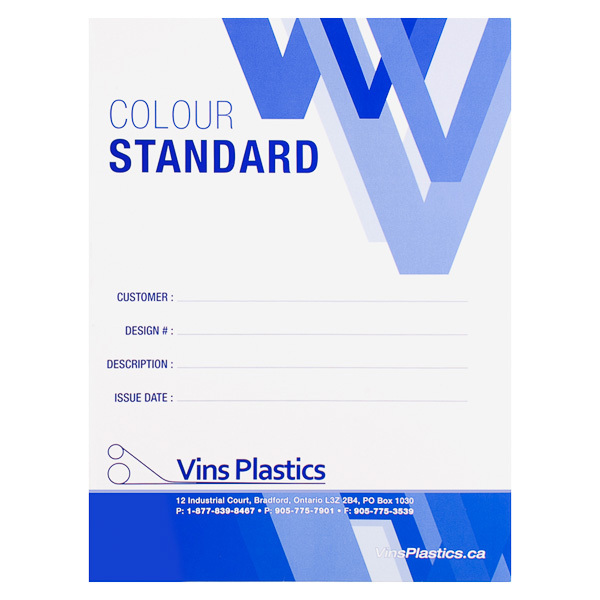 Blue V's indicate Vins Plastics is trusted and stable, while a space for customer and product info in the center shows the brand is detail-oriented. Contact information is easily accessible at the bottom of the cover. The blue and white color branding continues on the three pockets, which are labeled to help clients organize their documents. The right exterior panel houses important job details, and a multi-color printing disclaimer appears on the back along with a place for approval. Side 1 printed with four-color process, 1 light coverage PMS color, and 1 foil stamped area. Side 2 printed with 1 light coverage PMS color. 12pt C2S Semi-Gloss stock coated with Aqueous Soft-Touch on Side 1 and Aqueous Satin on Side 2. H4 business card slits on center pocket. 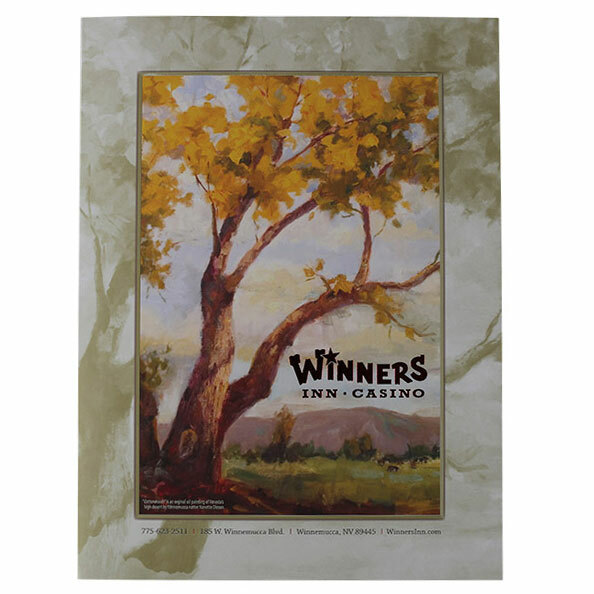 A medley of watercolor paintings and photographs bring Nevada's rugged mountains and a casino's hustle and bustle together in this tri-panel design for Winners Inn & Casino, based in Winnemucca, Nevada. Its wide array of images showcase both the natural setting and the indoor dining and activities at the venue, while its use of multiple imprint methods and coatings creates a totally unique tactile experience. Three curved pockets are each shaped differently for a creative, playful user experience. Both the left and right pockets slope toward the center of the design, while the center pocket peaks near the middle of its panel. This change in height from highest to lowest points exposes parts of the 8 1/2" x 11" contents that are normally covered, adding intrigue. Place separate designs on each panel, or create one continuous design for a unified visual experience. Dimension Open: 26 7/8" x 12"